Lu Over The Wall ACU Giveaway! From visionary director Masaaki Yuasa comes a joyously hallucinogenic but family friendly story of Lu a young musically gifted mermaid who unexpectedly joins Kai and his friends’ band. The talented but adrift Kai bonds with the spirited Lu but their friendship is at odds in a town where it is believed that mermaids bring disaster. An official selection of Sundance 2018, Lu Over the Wall is a toe-tapping, feel-good demonstration of Yuasa’s genre-mixing mastery that will leave you humming long after you leave the theater. 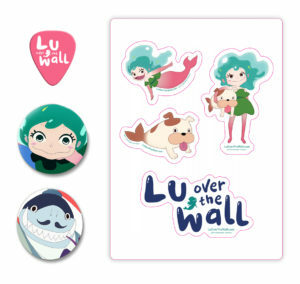 Win 2 tickets to see Lu Over the Wall at a location of your choice, plus some exclusive merch from the film! CONTEST RUNS UNTIL MAY 5TH!